Mavis decided that today was cleaning day so I had to make myself scarce. I used the time to climb a 200 ft high headland near the RV Park. Then we drove out to the Long Point Lighthouse at Devils Cove Head which offers spectacular views from a height of 330 feet. The view over the cliffs looks a lot like California in the Carmel area. 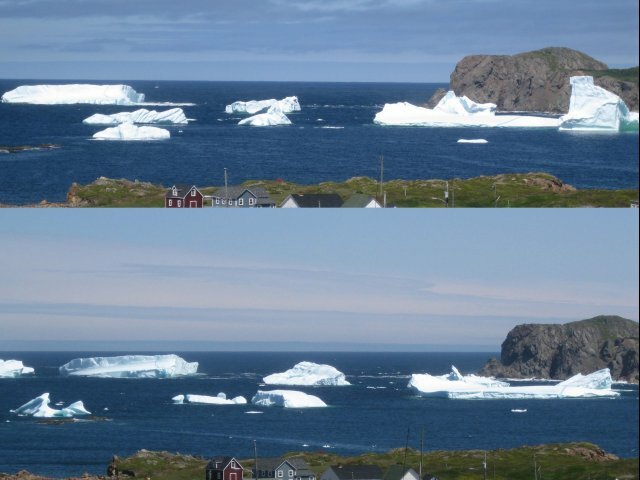 We then returned to Durrell to see the icebergs once last time and to see how much change had occurred over the past 20 hours. Today's photo tells the story. The top photo is July 7th and the bottom is July 8. At noon we said goodbye to Twillingate and headed for St. John's with an overnight stop at Terra Nova NP. It's the first National Park to offer electricity. It's a very large campsite with 371 sites, all in the woods. There are trails along the Newman Sound but little else to do. There is supposed to be an Outdoor Theater with an event tonight but after walking around for 45 minutes I could not find it. All the maps we were given show trails leading to it but don't show where the Theater actually is. It could be a couple of miles away. We should get to St John's around noon tomorrow.